How do I get my skis to grip on ice? How do I get more performance out of my skis? How do I get my skis to carve? How do I move from one turn to the next? Well my friends… to do all these things you need to understand lateral balance and how it affects your edges. Ever notice how you can lean into a turn while skiing and not fall over… in fact, if you don’t lean into the turn you will probably tumble pretty hard. When we have speed and we edge our skis, they apply a centrifugal force to the snow (hence why the snow sprays out, away from the centre of our turning circle). In return, the snow applies a centripetal force (towards the centre of the turning circle) to our skis, and hence, so long as we’re getting our centre of mass inside the turn (leaning in), balancing against this new added force, we will travel in an arc – marvelous! 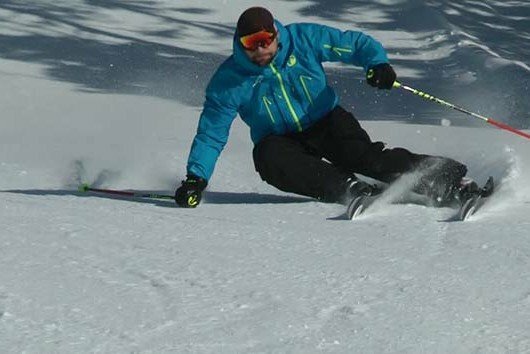 The major factors in skiing that affect how much “‘inclination’ is needed to maintain lateral balance are speed, turn shape and the amount of grip your edges have on the snow. 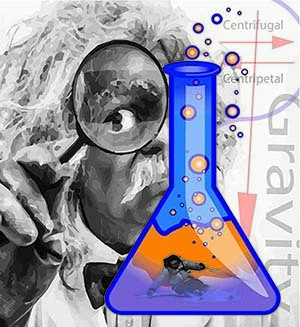 On planet Earth, gravity is constant, but if you’re going really fast and you turn really sharply, there will be more centrifugal force and you will need to incline further. If you are going slow and make a longer turn shape, the amount of inclination needed will be much less. Leaning to balance against these forces has another desirable effect aside from just keeping snow off your new ski suit… it also tips the skis up on edge. When the skis are tipped higher on edge they usually grip more, they also bend which makes the ski carve. 2) Need to edge more but can’t lean any farther? Here’s the real kicker… leaning is great but if that’s your only trick you will be pretty limited. When you need to create higher edge angles, you also need to create angles in your body. Believe it or not we call this angle making “angulation.” Essentially it is like folding you body segments to form a “C” shape so the edge angle against the snow increases but the line of inclination doesn’t… that way you can edge like crazy and still maintain balance. Now I see a lot of skiers out there trying persistently to angulate with their knees. Unfortunately, the knees don’t move laterally (or at least mine don’t). You can however, allow a knee to move inside slightly by pronating the foot and turning the leg in the hip socket but this sort of angulation is fine tuning. The real secret is in the hips. If you think about moving your hips to the inside of the turn and keeping your shoulders to the outside this is where you will start to see high edge angles and a lot of performance. Here’s a simple exercise to help you master “angulation”. Make some round turns while cruising at a fairly good speed. If the speed is high enough you will naturally feel the urge to incline and the hips will move towards the inside of the turn. While you do this try to keep your chin over your big toe on your outside foot. If it feels weird that’s probably a good sign as means you’re doing something different that your body isn’t used to. Keep at it. 3) Which ski? Inside or outside… and how much on each? My guess is that this little exercise was much easier when you were jumping from the outside foot. That’s because our bodies have evolved to make more powerful lateral moves from the outside leg and therefore balancing against the outside ski will align you in a much stronger position to resist the forces. I’m not trying to say that it is only the outside ski that does the work, but it makes sense that it should be the dominant one in most situations. Aside from being stronger the more pressure you put on the edge of the outside ski, the more that ski will grip…. and bend. As mentioned earlier having the skis grip and bend is often a desirable effect. Of course there are times when you want less grip and times when you want less pressure on your outside ski. This is often the case in softer snow to avoid the dreaded outside ski diving into the abyss. In this situation you still want to balance mainly against the outside ski but use a muscular effort with your inside leg to apply the appropriate amount of pressure to the inside ski. This will help create a bigger platform for the softer snow while still allowing you to maintain a strong lateral position. Using a muscular effort with the inside leg (instead of balancing directly on it) will also allow you to quickly adjust for changing conditions. 3) So now I can get on the edge… how do I get off it? Being able to release your edges is just as important as being able to get on them and this is where angulation has a nice side benefit. It sets you up at the end of one turn in a good position to release your edges and move into the next turn. Because you will be well balanced over the outside ski, all you have to do is relax… and with a little roll of the ankles your body will flop on over into that new turn to start it all over again.